My July mosaic workshop is fully booked but here are some more dates if you would like to learn how to mosaic. It would be lovely to share my passion of mosaics with you! Mosaic workshop gift vouchers available. Create a mosaic plaque 22 cm x 22 cm (for indoor display) – Price £50 (including all materials, refreshments provided, please bring lunch). 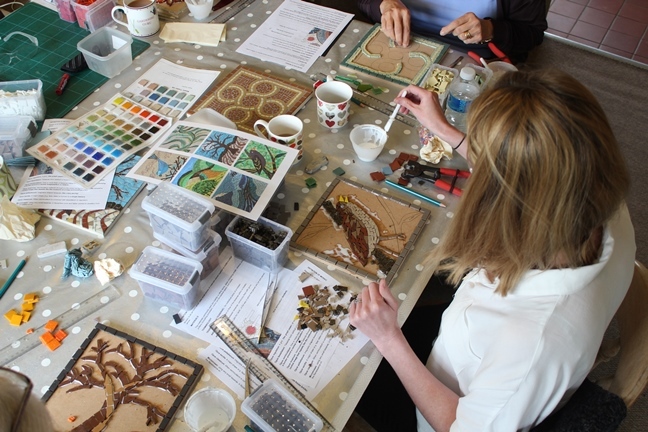 Discover the materials and methods of making mosaics using the direct method while creating your own indoor mosaic. I will show examples of materials, explain the five steps of making a mosaic using the direct method and provide examples of my mosaics for illustration. Tips on suitable designs for mosaics and different mosaic styles will be discussed along with future possible projects. Books and resources, including websites, and sources of materials will be provided for reference. I provide designs which you may use to create your mosaic or alternatively you may wish to bring along your own design to fit a 22 cm square base.